We request you to support 4.5 year old Sidrah Kadari. This child has undergone an Open Heart Surgery in May 2014. 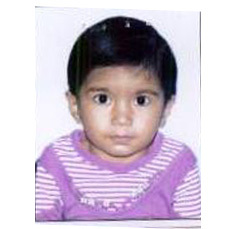 She is very enthusiastic and sweet Child who still needs to continue with medications. Sidrah’s mother who has been separated from husband takes tuitions and hardly earns anything to fulfill their basic needs. She is worried as Sidrah needs nutritional support for healthy life and she is unable to provide her healthy food and education. Child Help Foundation depends on the generosity of individuals to offer help to Sidrah to educate this girl child and also help her to lead a healthy life with her regular medications.